There is more than one known artist who once went under the name Covenant: 1. Swedish electronic act Covenant was started by a group of friends in Helsingborg in western Sweden. Eskil Simonsson, Joakim Montelius, and Clas Nachmanson inspired by bands like Kraftwerk, The Human League, and by EBM pioneers Front 242 and Nitzer Ebb. In university life in Lund southeast of Helsingborg they assembled a small recording studio in Nachmanson's bedroom and began to experiment with their own musical compositions. 1. Swedish electronic act Covenant was started by a group of friends in Helsingborg in western Sweden. 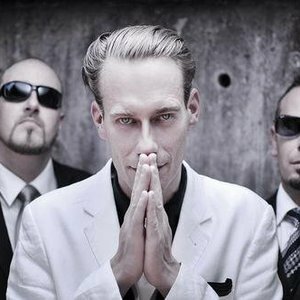 Eskil Simonsson, Joakim Montelius, and Clas Nachmanson inspired by bands like Kraftwerk, The Human League, and by EBM pioneers Front 242 and Nitzer Ebb. In university life in Lund southeast of Helsingborg they assembled a small recording studio in Nachmanson's bedroom and began to experiment with their own musical compositions. In 1989, the name "Covenant" was selected for the group, the name derived from the spiritual bond the trio professes to share. Their first publicly-released track "The Replicant", was made by invitation of Swedish record label Memento Materia and released on a compilation album in 1992 The track thrilled label executives prompting them to ask for a full album. In 1994, the group compiled enough songs to release the album, which became Dreams Of A Cryotank. It was well received by critics and fans alike, and with its success they decided to take their musical efforts more seriously, upgrading and adding more equipment, relocating their studio, and committed to tour. In 1995, Covenant performed at a festival in Germany on request of Off-Beat Records. The band impressed Off-Beat's A&R representative, who signed them to a record deal the following day leading up to 1996's Sequencer. San Francisco-based record label 21st Circuitry agreed to distribute Covenant's albums in the United States, expanding the band's reach and Covenant recorded the Theremin EP in 1997 specifically for an American release and began touring throughout the US and Canada. After some label developments with Off-Beat, Covenant was signed with Subspace Communications in Sweden, effectively ending their tenure with Memento Materia. Meanwhile, 21st Circuitry Records ceased operations, leading the three to find a new home in America with Metropolis Records. United States of Mind was released in 2000 and with it Covenant's tendencies strayed further into synth pop. A live album, Synergy was released later in the year. The sixth studio album Skyshaper was released in March 2006 followed by tours in Europe prior to the album's release and then the United States. In 2007 Clas Nachmanson departed the band. In October 2007, Covenant released the road movie In Transit on DVD containing recorded material from the Skyshaper world tour and documents the band's travels in Europe, North America, South America and across Russia for a period of 18 months. 2. Covenant, now known as The Kovenant, was a Norwegian band which has evolved from a melodic symphonic black metal band to industrial metal/harsh industrial on more recent albums. The band changed the name due to a dispute with the Swedish band that shared the same name. 3. Covenant is also the name of the progressive rock project of Dave Gryder, ex-drummer of metal band Rotting Corpse. So far, he has released one album under the Covenant moniker: 1992's Nature's Divine Reflection, on which he plays all the keyboards and drums.